CB's Coolest Cabin! Featured in numerous magazines! On Coal Creek w/Hot Tub! Sleeps 8 guests in luxury! Coal Creek Cabin in Winter Fantastic Cabin on Coal Creek Welcome to Coal Creek Cabin The living room with vaulted ceiling gives a wonderful sense of space Enjoy Family Games and the Wood Burning Stove Every detail has been thought out in this luxury cabin Enjoy a game of checkers Flat Screen TV in Living Room Gourmet kitchen with breakfast bar Large family table with views of Coal Creek Fully Stocked Gourmet Kitchen and Dining Plenty of space for meal prep Powder bathroom next to the living room Master bedroom with king bed Master suite with King Bed Master Bathroom with Soaking Tub Large Walk-in Shower in Master Bathroom Second Bedroom with King Bed and private balcony King Guest Bedroom Full Bath Upstairs with Shower The upstairs reading nook is the perfect place to curl up with a good book. Third Bedroom with King and 2 Twins The second deck is a private oasis with sunken hot tub Hang out around the fire pit in the evening Time slows down when you relax around the fire pit. 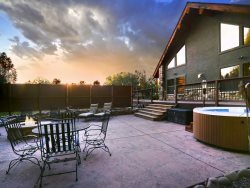 This home is without a doubt one of the most spectacular vacation rentals you will find anywhere. Lovingly restored with no detail overlooked, this log cabin located in the historical district of Crested Butte and situated right on Coal Creek will wrap you in comfort and luxury. Constructed with local craftmen and utilizing reclaimed barnwood and logs this home has details you won't find anywhere else. For instance, all of the the door-knobs, towel bars, and drawer pulls were architectural salvage finds from turn of the century buildings in New York. Being positioned right on Coal Creek a person can open almost any window in the home and listen to the sounds of the soothing water outside. Better yet, step outside onto any of the 3 decks, one with a private HOT TUB, and let the spectacular setting take the stress away. After all, life in Crested Butte runs at a slower pace. Stepping inside this cabin on Coal Creek will undoubtedly take your breath away. On the first floor you will step into the great room which consists of the living, dining and kitchen areas designed so that everyone is a part of the action. There is access to 2 of the outdoor living areas off this level as well as the master bedroom with king bed and INCREDIBLE master bath. The kitchen is a gourmet cook's dream with Sub-Zero fridge, Fisher & Paykel dishwasher drawers, AGA stove and oven, and reclaimed wood custom cabinetry. The reclaimed timber breakfast bar is one of a kind and not to be missed. In the living room, wrap yourself in leather luxury and enjoy a movie on the huge flat panel or just toss some logs in the wood-burning fireplace and enjoy a cocktail with the sounds of smooth jazz on the stereo. Take a trip up the stairs and don't miss the custom iron work painstakenly created by local craftsmen. Upstairs you will find two bedrooms and a full bath with a shower made out of tin and river rock! (You have to see it to believe it.) There is a king bed in the second bedroom with it's own private deck overlooking Coal Creek. The third bedroom is furnished with custom log beds consisting of a king and two twins. Grab a novel and enjoy the quiet reading loft tucked away on the landing. Outdoors you will find extensive decks to enjoy our 300 days plus of sunshine a year. The back deck has a recessed hot tub right next to Coal Creek and is equipped with a gas grill for those trout you caught earlier in the day. All of this only a few minutes walk to the heart of Crested Butte's world class dining and shopping. A one-of-a-kind log cabin, a hot tub on the creek, world class fishing, skiing, and hiking, all add up to a well deserved vacation here in Crested Butte! What a fabulous house! Our family of 8 fit perfectly and had a blast. We stayed at this property nine years ago and had such great memories that we decided to rent again. We were not disappointed. The house is still as amazing today as it was so long ago. It's so nice to sleep with the windows open and hear the water in the creek flowing all night. Such a peaceful home but yet completely close to town. We loved walking to town for shopping and dining at the wonderful restaurants in Crested Butte. Thank you for thinking of everything! We loved staying in this property! It is decorated so beautifully, and has all the amenities we could need! We love that it is a historic cabin that is renovate and updated! Both Steve Ryan and Katie Harper were very friendly and helpful! The Coal Creek Cabin was beyond our expectations. The pictures don't compare to the true experience of staying in this cabin . It is exactly the type of cozy, warm, homey cabin that you would want to share with your friends and family over the Christmas holiday. All amenities needed are provided, attention to detail and furnishings was first class. We thoroughly enjoyed our stay at this property and will likely do so again. This was our first time to CB and a very memorable holiday vacation. Steve was so very helpful in assisting me with the appropriate property to meet my family vacation needs. Steve provided helpful hints and places to eat, shop and when reservations should be made in advance. He came and checked in with us our first night and brought us a pack play for our use, as we brought our grandbaby with us, and ensured all our questions were answered regarding our stay and the property. It was very appointed as far as accommodations went. The linens, kitchen supplies, furniture, etc. was top-notch. In addition there were some really nice touches like a very cute 2nd floor reading nook, jacuzzi and separate "hot tub towels", awesome wood-burning stove, master suite with luxury bathroom and shower/oversized tub, etc. my kids and husband love log cabins and this one was the perfect combination of rustic-charm and modern convenience! Just a dream log cabin along coal creek and a perfect respite from a day spent on the slopes. Ironhorse was terrific! It was an easy, great experience overall. Would definitely use this property management company again. Slice of heaven tucked into this gorgeous little town. The house, the kitchen, the decks, roaring creek, the art, the personal touches, the town. This could be my favorite place in the world. Courteous and easy to work with. Second stay at an Iron Horse property in town of Crested Butte. We have stayed at many such properties in various locations over the years - yours are truly outstanding in attention to detail, cleanliness, amenities and location. We will be back. Katie at Iron Horse was both professional and friendly! She answered any and all questions in a timely manner!!!! The Coal Creek Cabin was beautifully appointed in furnishings as well as art work. We enjoyed the cozy atmosphere and especially the big kitchen picture window where each morning as we breakfasted we were treated to a show by the local and lovely Magpies! The Iron Horse team is excellent! Extremely professional, helpful, and quick to resolve any requests or issues. I've rent on Homeaway/VRBO many many times over the years and have always rented for the home itself, not the manager. The Iron Horse has me only looking at their properties now as I know the level of service and home I'll get with a home they manage. House is amazing and exceeded all expectations from the pictures. I could not recommend it more highly! Ironhorse was terrific! It was an easy, great experience overall. Would definitely use this property management company again. This was a wonderful property for our family of 6! It was very appointed as far as accommodations went. The linens, kitchen supplies, furniture, etc. was top-notch. In addition there were some really nice touches like a very cute 2nd floor reading nook, jacuzzi and separate "hot tub towels", awesome wood-burning stove, master suite with luxury bathroom and shower/oversized tub, etc. my kids and husband love log cabins and this one was the perfect combination of rustic-charm and modern convenience! Just a dream log cabin along coal creek and a perfect respite from a day spent on the slopes. Both Steve Ryan and Katie Harper were very friendly and helpful! We loved staying in this property! It is decorated so beautifully, and has all the amenities we could need! We love that it is a historic cabin that is renovate and updated! Steve was so very helpful in assisting me with the appropriate property to meet my family vacation needs. Steve provided helpful hints and places to eat, shop and when reservations should be made in advance. He came and checked in with us our first night and brought us a pack play for our use, as we brought our grandbaby with us, and ensured all our questions were answered regarding our stay and the property. The Coal Creek Cabin was beyond our expectations. The pictures don't compare to the true experience of staying in this cabin . It is exactly the type of cozy, warm, homey cabin that you would want to share with your friends and family over the Christmas holiday. All amenities needed are provided, attention to detail and furnishings was first class. We thoroughly enjoyed our stay at this property and will likely do so again. This was our first time to CB and a very memorable holiday vacation. Steve and his team were friendly and always available to meet our needs. I would highly recommend Ironhorse to everyone going to CB that needs to rent a place to stay. Coal Creek Cabin was perfect for our group. Comfy and right in town. For those wanting water flowing off the deck it is delightful. The Iron Horse team took the time to understand exactly what we were looking for and found the perfect property. Coal Creek Cabin is an awesome luxury cabin right on the creek. Walk to dinner and shopping. They thought of everything. It's fantastic! Steve and Jennifer at Iron Horse Properties are a complete pleasure to work with. They are both very professional, courteous, and accommodating! I would absolutely choose an Iron Horse Property over any other property when visiting Crested Butte...and I visit quite often! Iron Horse Properties are beautiful and very well maintained. Coal Creek is simply perfect and exceeds every expectation! Wonderful stay. Best-equipped rental we've ever had. So convenient to everything we enjoy! Reservation process was easy and complete. Staff was great. Property was well-maintained and exceeded our expectations. One of my tests for a property rental is how well-stocked the kitchen is. I found more than adequate cooking pots, dishes, linens and "gadgets" for all our needs. It was the best-stocked rental we've ever had. So comfortable and "homey". the staff was very helpful and informativestarting with the reservation process. they helped me to choose the property that would best suit us. it was a beautiful peaceful spot right on coal creek. we accommodated a large group with ease and enjoyed a wonderful 4th of july in crested butte.we needed a hose to clean bikes, the staff brought us one within hours.i had difficulty operating the tv, again, staff came to help us immediately. we have only great things to say. thanks for a wonderful vacation. beautiful spot on coal creek. a little oasis in cb. This is our eighth or ninth trip to CB in the past decade and this was our best trip! We loved your home! Everything about it is fantastic the attention to detail is amazing and the quality is much appreciated. Thank you!